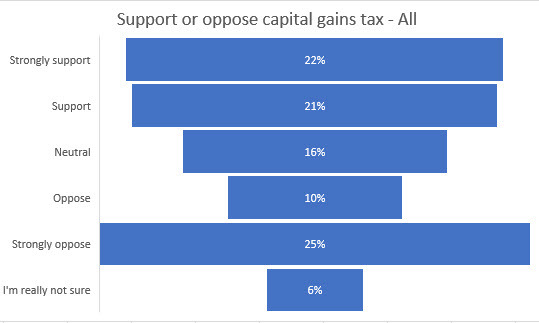 44% of new Zealand adults support introducing a capital gains tax. 35% oppose. A Horizon Research February 28-March 15, 2019 nationwide poll finds 16% are neutral on a new tax, while 6% do not know. 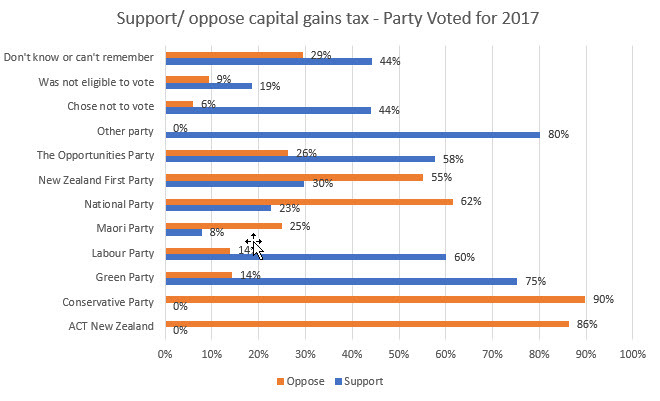 However, while overall support is higher, opposition to a new tax is extremely high among voters for National, ACT and New Zealand First (NZF), indicating the strength of sentiment the governing coalition will need to manage if NZF is to support some form of tax change. Opposition is also very high among National voters (62% oppose, 23% support). ACT voters are 86% against and none are for it. Among NZF 55% oppose, 30% support, while 15% are neutral. A new tax is well supported by Green Party voters (75% for,14% against), Labour voters (60% for,14% against), Opportunities Party voters (58% for, 26% against) and those who chose not to vote in 2017 (44% for, 6% against). The survey also measured what types of assets New Zealanders owned, and their support or opposition to introducing the new tax. Among those with assets, on which a tax has been suggested on capital gains made after 1April, 2021, opposition is mostly extremely strong. Beneficiaries of trusts owning commercial property: 67% oppose, 27% support. Own my own home with a mortgage: 47% oppose, 42% support. One of the potential hurdles for the government in passing a law introducing a capital gains tax but delaying its start date until after the 2020 general election, are the likely stances taken by those who are more likely to actually cast votes, based on results of recent elections. The number who own assets likely to be affected by taxing any gains made after 1 April 2021 is relatively smaller compared with the adult population overall. For example, the results indicate 3% of adults own a holiday property they do not live in, around 95,960 of the country's 3,198,960 adults. A similar number own lifestyle properties and around 607,802 own shares in companies, 348,369 of whom oppose a gains tax and 218,815 support it. However, many who strongly supported National in 2017 oppose a new gains tax and are likely to turn out to vote more than some others who support a gains tax, based on past voting behaviour. Among those aged 55+, who are more likely on average to vote than adults overall, more oppose than support the introduction of capital gains tax. Among 55-64 year-olds opposition is at 43% (support 38%), 65-74 year-olds 46% support, 37% oppose) and among those aged 75and older 47% oppose, 38% support. Highest support by age is among those aged 35-44 years: 51% support, 34% oppose. Retired/ superannuitants: 49% oppose, 38% support. Homemakers not otherwise employed: 47% support, 25% oppose. "The Government is considering a report recommending, among other things, the introduction of a Capital Gains Tax. This would extend income tax to all forms of capital income including capital gains made from 2021 (on the sale of assets like rental properties, businesses), while reducing income tax paid by lower and middle income New Zealanders." They were then asked if they would support or oppose the introduction of a capital gains tax. Respondents were also asked to say which assets they owned and were presented with an asset list. The survey has 1,116 respondents aged 18+ and was undertaken between February 27 and March 15, 2019. Results are weighted to ensure the sample presents the New Zealand adult population at the 2013 census. At a 95% confidence level, the maximum margin of error is +/- 2.9%. The New Zealand Herald - "Turkeys don't vote for Christmas"
The survey was conducted by Horizon Research in the public interest. Telephone: +64 21 076 2040.